I went to High School in Hereford where I completed my GCSE’s. Upon leaving school I decided I wanted to give Sixth Form a try. I chose to do A Levels in Mathematics, German, Business Studies, and Physics. After my first year I found that Physics wasn’t for me so I dropped the subject and continued with the others. During college our tutors wanted us to start the university application process. We also had meetings with our careers adviser to explore other pathways. I didn’t really want to go to university because I didn’t think my grades would be good enough and I wasn’t keen on paying the higher university fees. After a meeting with my careers adviser I decided to see what apprenticeships were about and maybe apply to some training providers. I went home and spoke with mum and dad. Luckily they were very supportive, and that helped me make the decision in applying to the local Training Provider – Hereford & Worcester Group Training Association (H/WGTA). I applied and was successfully offered an apprenticeship with a manufacturer in Malvern – Dytecna Ltd. I started my four year engineering apprenticeship in September 2012. I spent my first year with H/WGTA, where I completed my NVQ Level 2 in Mechanical Engineering. At the same time, I attended college one day per week studying a BTEC National Diploma in Engineering Manufacturing. Fast forward a few years, I was made redundant from Dytecna because the company went into administration. I found that Southco Ltd in Worcester were offering apprenticeships, and fortunately they offered me a place to continue my apprenticeship and finish it. During this time I finished my BTEC level 3, a Foundation Degree and an NVQ Level 3. My role at Southco is design engineering apprentice. We manufacture Access Hardware. This is anything from the glove box latch in your car, the security lock in a data storage cabinet, plus much more. My role includes the modification of these products. A customer can come to us with a requirement for a different colour, or head style, of latch. This is the type of project that I design and manage. I also help with any technical support queries customers and colleagues may have. It often takes a vast amount of product knowledge to answer these questions, and this is something I am getting better at, the more I do. I also found when first starting to use the systems and software that Southco use it wasn’t easy to pick it up quickly. I decided that it would be helpful for future apprentices and new-starters if they had a guide book that they could use for quick, easy steps to help them through their first weeks on the job. So I created a guide book which was published on our internal database. 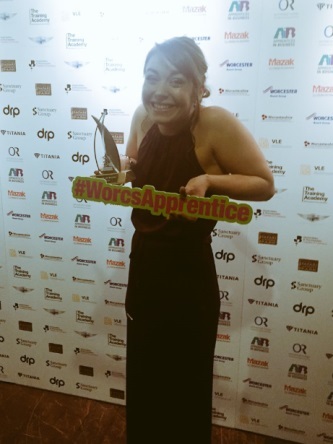 Over the course of the next 12 months it is my intention to help you in understanding what apprenticeships are about, the events that you can get involved with, and the types of companies in Worcestershire that offer apprenticeships in all industries. I would like to broaden your choice of pathway so that when you come to finishing school, college, or if you just want to start in a new industry, you feel you are informed in deciding on where your pathway will take you next. The future looks bright for apprentices across all industries. I think that anyone can do an apprenticeship, whether you actually enjoy studying, or whether you don’t enjoy studying, an apprenticeship works both ways. It is important to think of an apprenticeship as a stepping stone to help push you forward. You won’t be an apprentice forever, but when you come out of the other side, you will really feel you have achieved so much.